Your Chinese factory is lying to you and they don’t even know it. Brands often encounter substantial difficulty getting straight answers from their contract manufacturers. We studied 14 electronics assembly operations in Guangdong for 6 months to find out why. To many product companies (Brands) doing business in China, it feels like their contracted factory (CM) is often hiding something from them by shipping units that fail too frequently while claiming they’re testing every unit. Data recently released by an audit firm, reveals that nearly 1 in every 3 customer orders they evaluated failed to meet the relevant standard. Our data puts that number at closer to 1 in 5. That’s a 20% to 30% defect rate! Either way, it’s a huge problem. …don’t fully understand the standards held by the brand and/or disagree about the details of what defines a “good” (e.g. passing) unit. …are not typically aware that their actual defect rate is substantially higher (31.5% higher on average) than they imagine it to be. We used Assembly Core to issue the same set of work instructions (SOP) to 14 factories building a compatible product to control for production complexity, supply chain, and other process specific factors. The study period encompasses 12 months of data starting in May of 2015, but sites came into and out of production during this interval. Accordingly, this analysis uses the first 6 months for which we have data for each factory independently. To mitigate environmental bias that may introduce, the worst values in the time window were used. To understand the Brand’s perspective, a survey was sent to Y Combinator hardware companies and our existing clients. Eight companies matching the profile responded. Answers from companies were duplicated to fill the imbalance between only 8 companies but 14 factories based on closest matching target (minimizing square error) and companies and factories were sorted by performance and paired to create the best possible pairings. In the figure above: Party vs. Expected/Actual Defect Rate. The left column, “Brand,” is the defect rate that brands self-reported as being expected or acceptable in production. 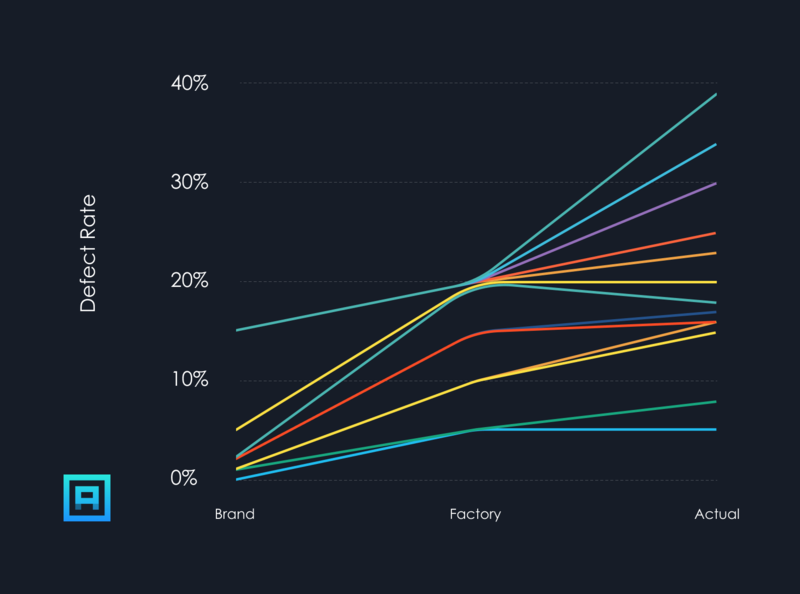 The middle column, “Factory,” is what the factories self-reported the acceptable defect rate to be. That means that below this defect rate, the factory will not make changes to its process and will simply absorb the losses (assuming they detect them). The right-most column, “Actual,” is the actual defect rate observed by Assembly sensors and personnel. UPDATED 2017.02.17: Addition of data table, inclusion of additional detail in methodology, and reorganization of content to improve readability.